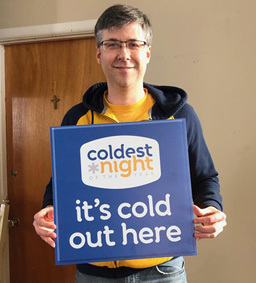 Morningstar Mission executive director Kevin Alkenbrack is helping to organize the local Coldest Night of the Year fundraiser. Submitted photo. Recently homelessness in Lennox and Addington has been a popular dinner time conversation in homes across the region. On Feb. 23 the conversation will leave the warmth of the kitchen and move outside as volunteers take part in the Coldest Night of the Year fundraising walk through Napanee. Hosted locally by Morningstar Mission, the event will see walkers depart the mission at 5:15 p.m. and embark on a two-, five- or 10-km walk through town in an effort to simulate what a homeless person must endure when living on the streets in February. A handful of warming rest stops will be set up along the route and a meal will be served back at the mission. Walkers aged 11-17 must raise, either through fundraising or paying themselves, a minimum of $75 while adults over 18 must raise or pay $150. Children under the age of 10 can take part in the walk for free. Money raised will go towards Morningstar, which works with local homeless people to provide warm meals and also assists with the recently opened warming centre, located at the Napanee Area Community Health Centre. Along with raising money, Alkenbrack says the event serves as a bit of an eye opener for people who may not realize some of the daily challenges faced by those with no roof over their head. Morningstar Mission has set a goal of $20,000 to be raised from the event. Anyone interested in taking part in the walk or corporate sponsors looking to get involved can visit CNOY.org/location/Napanee or call the Mission at 613-354-6355. The start and finish point of the walk is located at 59 Water St. W in Napanee. Along with Napanee, Coldest Night of the Year walks will take place in communities across Canada on Feb. 23.